Who needs a kayak when you have a golf cart? 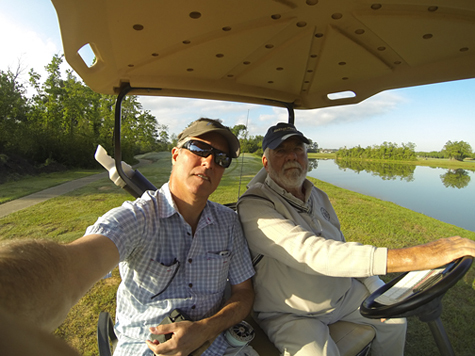 Tomball Golf Course Monday Fishing. In the interest of keeping readers apprised of new technology performance, like the GoPro Hero 3, I thought I would try some still images with the camera yesterday just to see what the distortion was like and if I could twist it to my advantage. 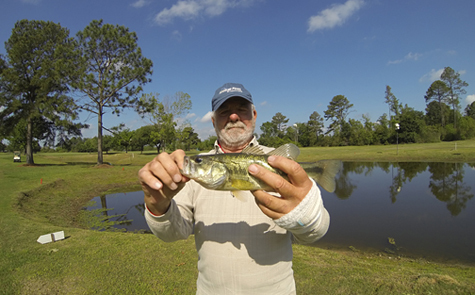 First, you will remember from the post on fly fishing for sand bass, that the GoPro Hero 3 has been a bit of a bear when it comes to performance. I lost significant amounts of good video due to a well known lockup issue problem, and was in contact with the company as I was simultaneously doing a firmware update. As of this writing I can tell you two things, 1) I received superior customer support in unprecedented time from GoPro, and, 2) DO THE FIRMWARE UPDATE. The camera is working like I expected it to work straight out of the box. I have the feeling the grumbles from unsatisfied users reached a fevered, if not class action pitch, and that firmware update probably saved their bacon. I was just about to give up. I really thought these images would be more distorted, but what I am still learning is that objects in the camera are much further away than they appear. Translation: Get super close for that insane distortion. Looking for some of that superwide distortion, but subject just not close enough to the camera. GET CLOSE with the GoPro Hero 3. You’ll be surprised what you get.